QIndian doubles legend Leander Paes and his American partner Jamie Cerretani stormed into the doubles final of the Dubai Duty Free Tennis Championships on Friday night. The 44-year-old Paes and Cerretani defeated Damir Dzumhur of Bosnia and Filip Krajinovic of Serbia 6-4 6-2 in the semifinals on centre court. Paes was in superb form and his net play especially delighted the Indian fans in the stands. "Thanks to the crowd for the support, for staying so late for the match. You guys are amazing," Paes said. Paes now will aim to win his third Dubai doubles title. But it will not be so easy for the Indian-American pair as they will face defending champions Jean-Julien Rojer of the Netherlands and Horia Tecau of Romania in the final on Saturday. Earlier, Rojer and Tecau, the second seeds, won their semifinal in straight sets (7-5 6-3) against the third seeds Ivan Dodig of Croatia and Rajeev Ram of the US. The match was moved to Court One from centre court when the score was 1-1 in the first set to allow the first singles semifinal between Lucas Pouille and Filip Krajinovic to begin on time. Rain stopped play again when the score was 2-2 in the second set after Rojer and Tecau had taken a tight first set. But the players were soon back on court when the drizzles stopped and Rojer and Tecau finished off the match in straight sets. 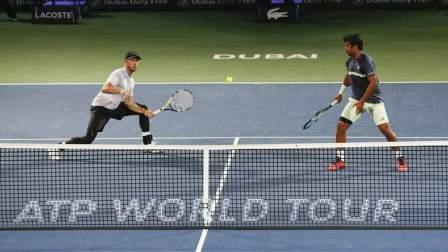 Victory in Saturday's final will make Rojer only third player after Indian doubles specialists Mahesh Bhupathi and Rohan Bopanna to defend the Dubai title.